Since the Sandy Hook public school shooting last year, the gun control debate in the United States has been on fire. Citizens are demanding that President Obama take action to restore order and safety to schools and public places where gun-toting madmen can prey upon the innocent. The ultimate question is: what action should be taken? This books, More Guns, Less Crime by John Lott, pores through decades of statistics on links between gun ownership, violent crime, concealed carry laws, and demographics. Through the length of this 500-page book you’re led through a mountain of facts and figures on the effects that gun control laws have had on various states and counties. The vast majority of people who reach their own conclusions on the issue of gun control are flawed for a simple reason: their perception is based on media manipulation and not actual fact. Lott’s conclusion – that gun control has the opposite of the intended effect of reducing gun violence – is convincing because it’s been through the scientific process. The idea of more guns reducing violence is counter-intuitive and appears nonsensical on the surface, but the evidence points to exactly that conclusion. Here’s how the theory works. A common belief is that the presence of more guns makes leads to a greater number of gun deaths, but this is not necessarily true. Gun ownership in rural United States is high, in the range of 60-70%. While gun ownership is much lower in cities (about 30%), the vast majority of gun deaths occur in these densely populated urban areas. States with liberal gun laws have lower instances of gun-related deaths, and states with concealed carry laws have even fewer instances. The point is this: gun control doesn’t stop criminals from arming themselves, it stops law abiding people from protecting themselves against criminals. It turns out that most criminals are rational like the rest of us: they calculate risk versus reward when committing crimes. In states with the highest arrest rates, criminals perceive increased threat and commit fewer crimes. In states with concealed carry laws, fewer rapes are committed because criminals never know who is armed and who is not. For women, the elderly, and anyone else who would otherwise be disadvantaged in a violent crime, guns are an equalizer: they confer equal firepower to whomever is wielding the gun. Additionally, our perception of guns is flawed. Because of our media immortalizing perpetrators of the most horrific crimes by constantly broadcasting sensational content (“if it bleeds, it leads”), we’ve become disconnected from the reality of public safety. Media companies are in the business of selling news and entertainment, and are terrible at fairly communicating complex issues like violent crime. The reality is that we’re safer than we ever have been and your chances of being killed or involved in gun crime has never been lower. If you base your opinion on TV and reading the newspaper, as most people do, you would reach the opposite conclusion: that the world is more dangerous than ever and that guns primarily enable criminals. This book challenges those assumptions. 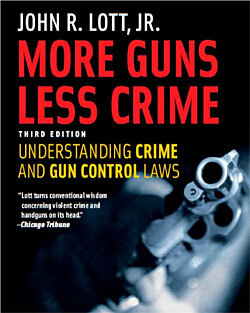 The argument asserted in this book runs contrary to the popular opinion that gun control laws need to be strengthened. Among the gun control debate there are some thoughtful and fact-filled commentaries like this one on Sam Harris’ blog, but the overall national narrative is overwhelmed by arguments based on emotion. People associate guns with death and violence, not defense, and they rarely bother to reference or include statistics on American gun policy (what a lot of commentators do is reference the effects of gun control in other countries, which is comparing apples and oranges). Although this book is enlightening, it’s not particularly enjoyable to read. It’s filled with facts and figures but feels tedious because the narrative falls short. After reading a few hundred pages I became tired of reading about crime statistics among demographic groups in middle-of-nowhere counties, which were accompanied by dozens of charts and graphs plotting statistics (like the one above graphing the effect of concealed carry on violent crime). At times it felt like I was reading a research paper and not a book, but not everyone can deliver a fact-filled 500+ page book that remains fun to read like Tim Ferriss’ Four Hour Chef (672 pages). If you want to become the most well-versed person you know on the facts behind gun control in the United States, read this book, but it will require some commitment.